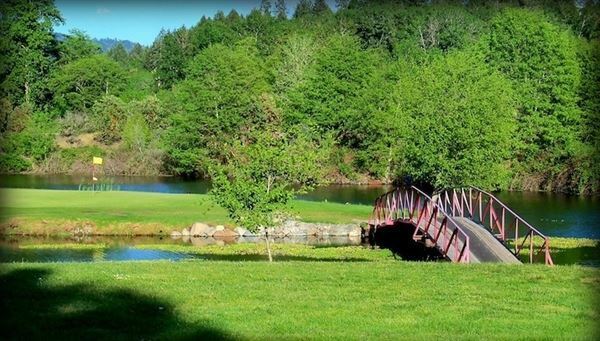 Weddings at Applegate River Golf Club are like having your own private country estate, surrounded by the ones you love most as you exchange your vows in a lush garden setting. Applegate River Golf Club has a variety of wedding services to help make your big day memorable. If you are looking for a quiet and serene location for your wedding celebration, you are welcome to come out and let us show you what we have to offer. Our wisteria covered gazebo is the perfect backdrop for your wedding service. The photo possibilities are unlimited all along our numerous waterfront settings. Event rental space, unique party planning options and ideas, plus a full and personalized catering menu. Full scale dream weddings, multi-day corporate retreats, intimate pond side ceremonies, company picnics and everything in between. We offer a number of service options that add depth and diversity to your events. The Rogue River Lodge…located in the Upper Rogue, a unique and pristine location nestled along the Rogue River. Just 30 minutes from Medford, on Highway 62, just 52 miles from Crater Lake National Park. This riverside venue is open for booking your exclusive rental from June through October. We provide custom event proposals to meet the needs of each event. We offer outdoor events with capacity up to 200 guests. Friday through Sunday. Here your guests can experience the beauty and tranquility of this historic riverside venue...whether it is celebration of marriage or a celebration of life. We can provide recommendations for catering companies to service all your food and beverage needs, as well as ministers, florists, photographers, DJ’s or live bands and any other vendors to meet your unique event needs. Our venue fee includes: The rental, set up/break down of tables, chairs, table clothes, wedding arch(s) Complimentary Overnight in Cabin #2, Warming Cabinets / Beer Tap / Full Service Station with up to 1,200 pounds of ice provided Coffee & Water Service for Bridal Party Private Bridal Salon & Dressing Area Two Hour Consultation and on site “day of” Event Coordinator One Hour Rehearsal week prior for riverside patio Full service indoor restroom services including family restroom and ADA accessible See Rogue River Lodge Facebook page for our wedding album and wedding reviews. 2018 pricing published on our website at www.therogueriverlodge.com under "Weddings". Located between Gold Beach and Brookings, OR, Crook Point hosts weddings of any size, large or small, from elopements to 200 guests. We have several locations where couples can choose to celebrate their nuptials for larger receptions. Depending on the tide, you can have a small, intimate ceremony on one of three private beaches. Please view our wedding gallery to gain a sense of how special your wedding will be at Crook Point. If you are interested in learning more, please contact us today! Ashland Springs Hotel invites you to enjoy 4 distinctive meeting rooms totaling 5700 square feet of banquet space. Our friendly, professional meeting and catering staff is here to assist you in creating a successful event in a beautiful and comfortable atmosphere. For gatherings from 10 to 200, make your meeting, conference or event memorable at the Ashland Springs Hotel. The Grand Ballroom, adjoining a palm-filled, naturally lit Conservatory, and adjacent English Garden, are an ideal location for celebrations, private and business functions, and weddings. The old-world charm and romantic elegance of the Grand Ballroom are enhanced by the golden glow of the mica and cast bronze chandeliers original to the hotel. Warm and inviting colors, comfortable seating and proximity to the garden, combine to create a stunning backdrop for a memorable banquet or meeting. The Courtyard Garden with cobblestone floor, complete with sundial, fountain, custom designed wrought-iron gazebo and trellises boasts a collection of old fashioned climbing roses, petunias, specimen trees, ferns and ivy. Ornamental garden planters spill out spectacular annual flowers all spring and summer. Garden tables, chairs and decorative lighting invite you to enjoy this charming outdoor setting, perfect for a late spring, summer and early fall event. Beautiful log construction lodge with large rooms all having a different theme: The Gold Miner's Cabin, Cattleman, Sportsman, Indian, Loggers, Myrtle, and a b eautiful honeymoon suite all await you! Each room has a deck overlooking the river and the historic Pioneer Bridge. All rooms have private baths with two person Jacuzzi Tubs. The Lodge is located next door to our restaurant. Each room is uniquely decorated and has its very own spa tub and a deck over looking this beautiful river. This spacious lodge was hand crafted from local and imported pine. Pull up a chair and have a glass of wine from one of our local vineyards, while you sit outside on our beautiful deck that over looks the Applegate River. We have packages available for Weddings, Family Reunions and Corporate Getaways plus other events you may have in mind. Come and just kick back and take in the ambience of the surroundings and experience the great Applegate Valley. Inn at the Commons is a fun, re-imagined boutique 1960s motor inn with retro style and modern amenities. Gather guests from near and far and set off on an adventure surrounded by simple, classic elegance. Inn at the Commons is the perfect setting for an intimate gathering of any size. Choose the Petite Ballroom, awash in natural light and customizable details. Keep the invite list long when you book the Grand Ballroom, featuring 6,000 sqft of flexible space with 12 ft ceilings and a secret garden. Experience Southern Oregon from here! This is the perfect launchpad for exploring everything the region has to offer -- from world-renowned vineyards to the edge of Crater Lake. With so much to do within an arm's reach, the Inn at the Commons is the quintessential place to call home - share stories, drinks and gourmet eats as you relax in Medford's burgeoning downtown district. We have 118 guestrooms, an outdoor pool and complimentary hot American breakfast, parking, and wifi. Inn at the Commons's on-site event specialists offer a full-service experience and are committed to sharing the best of Southern Oregon hospitality with you. We look forward to creating beautiful memories you'll cherish for a lifetime! The Tea Pot On Wheels is an event venue located on the Rogue River in Southern Oregon, between Grants Pass and Medford. We offer park like grounds for weddings on the banks of the majestic Rogue River. Included is a beautiful, large bridal suite with 2 large bathrooms. We offer 2 dining rooms perfect for, bridal tea parties, baby showers or any other gathering. Our large dining room has river views and a cozy fireplace. A restaurant that offers breakfast and lunch and a tea house. Our rental selection has china, linens, and unique items. We are your one stop shopping when looking for an event venue.